POSTED June 8, 2018 9:46 a.m.
Senior Grady Rielly capped off a spectacular career with the Redbirds’ track and field program by racing away with a state championship title in the boys’ Division 3 110-meter high hurdles to highlight an action-packed weekend at UW-La Crosse’s Veterans Memorial Stadium on Friday and Saturday, June 1-2. Rielly became the first Redbird in over a decade to stand atop the awards’ podium after leaping his way to the 110-meter high hurdles title in 15.23 seconds on championship Saturday. Stephanie Winters was the last Darlington athletes to be crowned a champion at the state track meet when she won the girls’ pole vault in 2007, while the Redbirds’ 3,200-meter relay team in 1998 was the last boys’ entry to bring home a state title. Rielly nearly earned another title in the D3 300-meter intermediate hurdles, posting a school-record time of 39.63 seconds in the finals as he finished a close second behind Cambridge junior Riley Olson (39.14). The two were neck-and-neck heading towards the final two hurdles before Olson pulled ahead and held off Rielly to claim the title. “I gave it all I had and PRed in the 300. I can’t get mad about losing to someone who runs that good. He ran like a stud today, so congrats to him,” Rielly replied. Rielly also teamed with fellow seniors Kameron Blosch and Curtis Blosch and junior Blake Whalen to finish ninth in the 4x100-meter relay final on Saturday. “I couldn’t be more proud of Grady and his performance of the state meet. 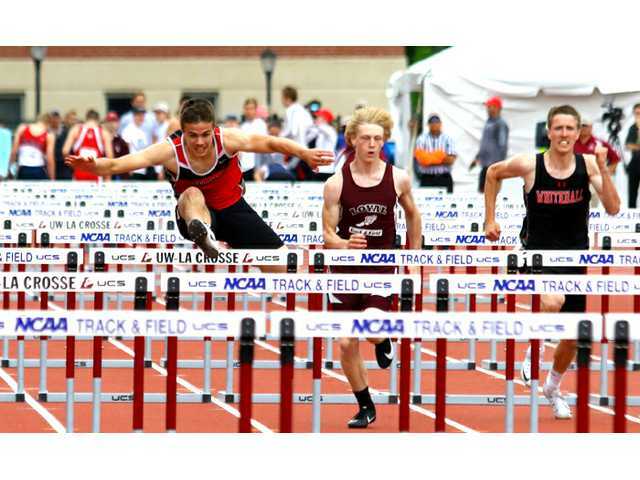 He worked very hard to accomplish his goals and was able to win a state title in the 110s and break his own school record in the 300 hurdles,” said Darlington head coach Pat Reichling. Rielly wasn’t the only busy ‘Bird at the state meet. Junior Payton Heinberg also competed in three state events and brought home two state medals, while C. Blosch competed in four events and relay teammates K. Blosch and Whalen each competed in three events. Heinberg broke his personal-best time in the 3,200-meter run to finish fourth in the event in 9:49.61, and he teamed with seniors Tanner Evenstad and Paul King and fellow junior Tucker Lange to place fourth in the 4x800-meter relay race on Saturday morning. Heinberg also finished 12th in the 1,600 run (4:41.73) on Friday in his first appearance at the state meet. “Payton had an outstanding performance on Saturday. He was able to run the fourth best time in school history and set a personal best by over 20 seconds. He also had his best split of the year in the 4x8 and helped the boys earn a medal,” Reichling noted. C. Blosch teamed with K. Blosch and Whalen to take ninth in the 4x200-meter relay along with senior Tyler Mosley, and the Redbirds trio joined with junior Trae Schilling to take 12th in the 4x400 relay (3:35.50). C. Blosch also took 14th in the pole vault (12’0”) for the ‘Birds. Senior Connor McGowan finished his career at DHS by placing 11th in the D3 discus (140’5”). The Redbirds finished in fifth-place in the boys’ D3 team standings with 28 points. Cambridge ran away with the team title with 62 points. Wild Rose and Bangor tied for second-place with 43 points, and Rosholt took fourth with 41 points. In the girls’ D3 meet, the Lady Redbirds had competitors in five events, but unfortunately had no state medalists or place winners. The 4x800-meter relay team of seniors Erin Wolf, Emma Crist, Miriam Lindqvist and junior Ilse Mendez led the way by finishing ninth (10:21.43) to start off the state meet on Friday. Mendez also placed 10th in the 3,200 run (1203.90) on Friday afternoon. The Lady Birds’ 4x200 relay team of senior Hunter Weber, juniors Kaylee Meyers and Kathleen Mathias and sophomore Lizzie Schwartz took 12th (1:50.49), while Weber placed 16th in the pole vault (8’6”) and sophomore Marissa Gould finished 17th in the shot put (33’3”) at the meet. Benton/Scales Mound/Shullsburg won the team title with 40 points. Algoma was second with 39 points, while Ozaukee and Newman Catholic tied for third with 38 points. “Overall, I was very happy with the way our athletes performed at the state meet. You always hope that you can perform your best at the state meet, but it doesn’t always happen. Our athletes competed well and ran some very competitive times and I couldn’t be prouder of them,” replied Coach Reichling.